The present study aims to estimate the variability in the tensile properties of the A5052 aluminium alloy processed through ultra-high-density sonication. An in-depth look at the quality index of the tensile properties to microporosity variations through a quantitative description based on a modified constitutive model for tensile instability. The test specimens were prepared as billets of 4 inches in diameter via gravity casting using a pilot-scale melt amount (30 kg) under the ultrasonic frequency of 20 kHz (4.4 kW). The ultimate tensile strength and yield strength of the as-cast A5052 alloy were increased by approximately 40 MPa and 10 MPa due to effective grain refinement through sonication compared to those of specimens without sonication. In addition, the nominal value of fracture elongation also exhibited a remarkable improvement of more than 5% by reducing the microporosity through degassing of the melt during sonication. The ultra-high-density sonication treatment using a Ti-horn to aluminium melt clearly maximised the effect of grain refinement by heterogeneous nucleation of foreign nuclei and fragmentation of dendrites, simultaneously with the degassing action accompanying the melt convection provided by ultrasonic excitation. 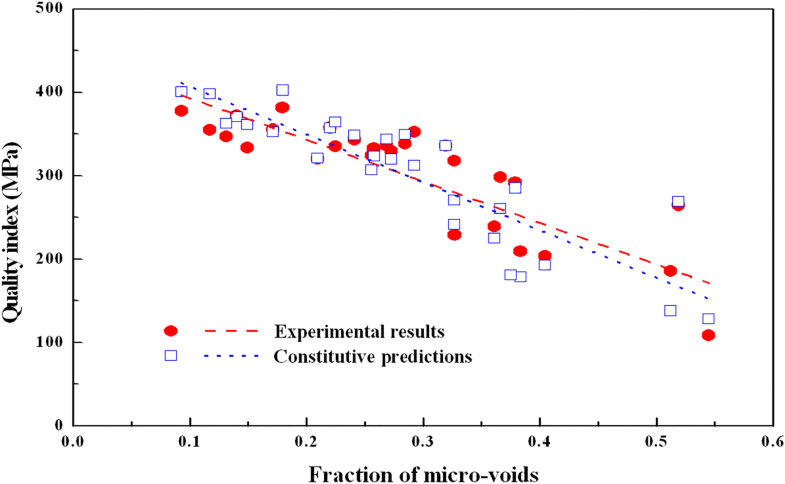 The dependence of the tensile properties on the microporosity variation can be expressed in terms of a quality index chart, which considers the porosity level, the distribution of micro-voids, and the strain hardening exponent through the modified constitutive model. 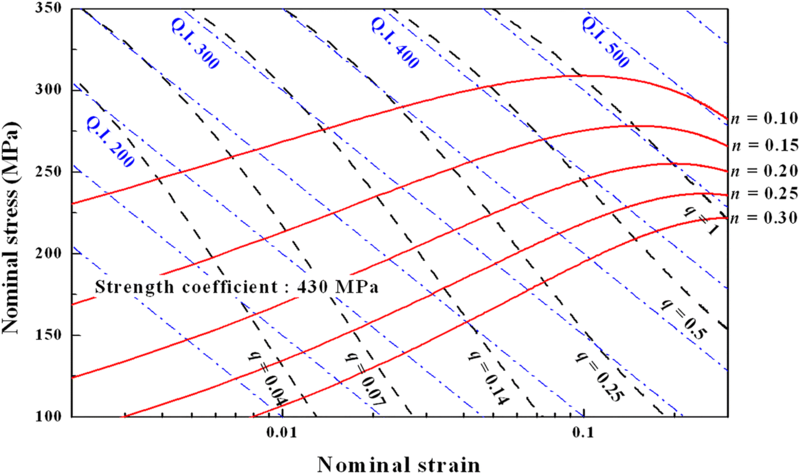 A quantitative description of the tensile properties of structural Al–Si series alloys was proposed empirically by Drouzy et al. in the 1980s as a quality index chart;1 remarkable progress on this research topic was made by Cáceres et al. 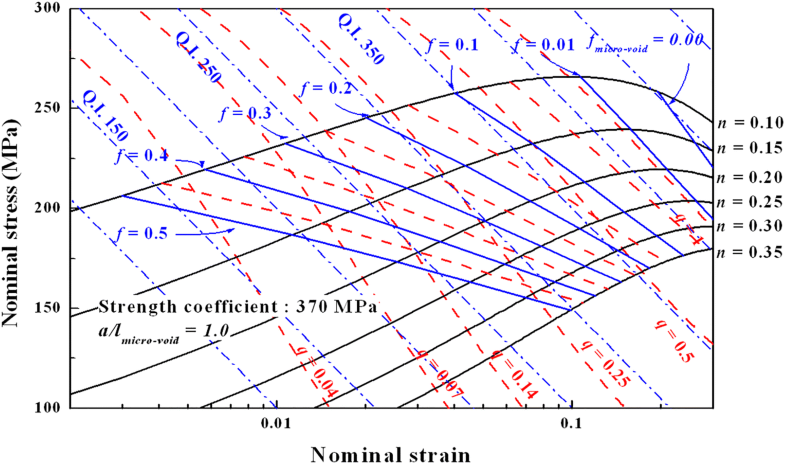 in the early 2000s.2, 3, 4, 5, 6, 7 They proposed a modified quality index chart using a systematic approach based on the constitutive model of flow deformation behaviour, including the introduction of a relative ductility parameter defining the overall level of strain to a strain hardening exponent (SHE) and the definition of the slopes of the iso-Q lines included in the original quality index chart proposed by Drouzy et al.2,6,7 The modified quality index proposed by Cáceres et al. is highly significant because it more precisely suggests definite directions for further improvement as well as quantitatively describing material properties. With this strong point, numerous studies on this topic have been performed for various aluminium casting alloys until recently.2, 3, 4, 5, 6, 7 The graphical framework, which includes the original iso-Q lines by Drouzy, modified iso-Q lines by Cáceres, and flow curves of the A356 alloy, is shown in Figure 1. As shown, it clearly describes the overall tensile properties in terms of the ultimate tensile strength (UTS) and elongation to fracture. The basic concept of the quality index can be applied to the tensile properties of wrought alloys as well as those of casting alloys; furthermore, it can describe the effects of processing variables on the tensile properties of wrought products as well as the metallurgical characteristics accompanying various casting processes. In particular, casting defects such as micro-voids and inclusions, even in the small sizes and amounts inevitably included with conventional casting processes, drastically deteriorate the final qualities of casting or wrought alloys. However, quality control of casting alloys based on the quality index considering the existence of micro-voids has not yet been applied. 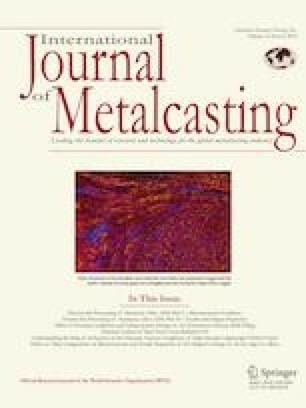 However, most such studies are restricted to the laboratory scale treating small amounts of the melt; the effectiveness of ultra-sonication on alloy systems with low alloying elements or large-volume melts has not yet been confirmed. Furthermore, scientific approach describing quantitatively the practical variation on the mechanical properties by ultra-sonication also has not been conducted until now. Therefore, in the present study, the grain refinement and microporosity reduction induced by the implementation of ultra-high-density sonication of A5052 alloy on the pilot scale are investigated. In addition, it aims to attempt a quantitative description on the improvement of tensile properties through the modification of the quality index, which considers the material properties and microporosity variations of the A5052 alloy. The raw material used in the present study was a commercial-grade A5052 alloy; the chemical composition of this alloy is given in Table 1. The raw material of 30 kg was melted in a SiC crucible, and test specimens were prepared in billet form using a metallic mould of 4 inches in diameter and 12 inches in length by the gravity casting process. The experimental apparatus of ultra-sonication used is schematically shown in Figure 2. As shown, the temperature of the ultrasonic generator and a region between the booster horn and Ti-horn (commercial pure grade, diameter: 42.5 mm) were maintained at a temperature below 30 °C by air- and water-cooling, in order to avoid the thermal damage of ultrasonic generator. Schematic diagram of apparatus used for the ultra-high-density sonication; (1) air-cooling, (2) PZT, (3) booster horn, (4) Ti-horn, (5) water-cooling, (6) melt. At sonication treatment, a horn was inserted at a depth of 50 mm from the melt surface. The horn was held in the melt for 3 min to ensure the stabilisation of the melt temperature before sonication treatment, and it was removed from a melt after a sonication treatment. And then, the sonicated melt was stabilised for 3 min at 780 °C and poured into the metallic mould, which was preheated to approximately 150 °C. The typical conditions for specimen preparation were chosen through several pretests of ultrasonic powers (3, 3.7, and 4.4 kW) and sonication times (0, 3, and 5 min) under the ultra-sonication frequency of 20 kHz. In the present study, the experimental results for the typical case of an optimal (5 min, 4.4 kW) and untreated specimens were used in order to discuss the effects of microporosity on the quality index of tensile properties. In terms of optimal condition of ultra-sonication treatment on A5052 alloy, the nominal level of grain size on sonication time and power was remarkably decreased as the sonication time increases up to 5 min and the sonication power increases from 3.0 to 4.4 kW. 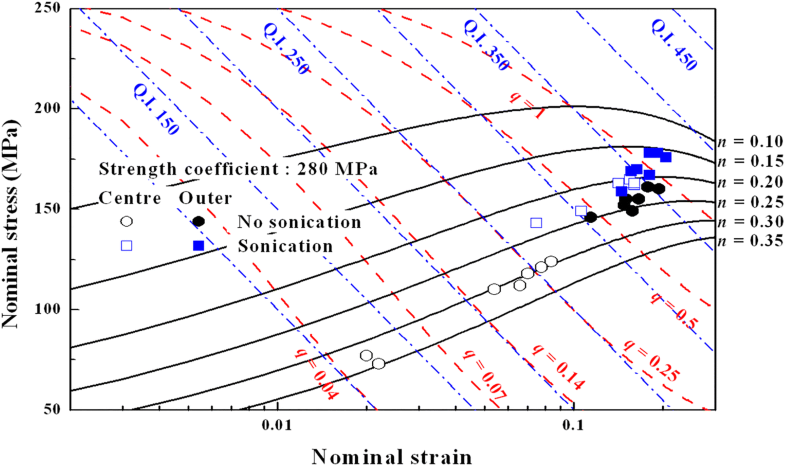 The variability in the microstructural characteristics and tensile properties with varying sonication conditions, such as ultrasonic power and sonication time, will be reported in a subsequent study. The specimens for microstructural observation were prepared by electrochemical polishing (ATA GmbH, Kristall 620) with Barker solution (2.5%HBF4/distilled water). The microstructural observation was performed using optical microscopy (OM). As a typical microstructural feature, the grain diameter was measured according to the intercept line method (over 5 positions at centre and outer sections for a given specimen condition) and was expressed as an average value, together with deviations among each view. Tensile specimens were fabricated to a plate type (gauge length: 40 mm; gauge width: 8 mm), over 10 pieces at least for each condition and position (centre and outer section of a billet). The tensile testing was performed at room temperature under strain rate conditions of 2.08 × 10−4 s−1 using an extensometer (UTM: Instron 5985, extensometer: Instron, Advanced video extensometer 2663-821). The yield strength (YS), UTS, and fracture elongation were chosen as the typical tensile properties, and the nominal value of the YS was measured as the stress level at 0.2% offset strain. The SHE was measured by plotting the stress–strain curve on a log–log scale for the strain range corresponding to obvious plastic deformation. The microporosity variations of the test specimens were evaluated in terms of volumetric and fractographic porosity. The volumetric porosity was determined by measuring the bulk density of the entire tensile specimen using the Archimedes method. The fractographic porosity was measured using quantitative fractography analyses by scanning electron microscopy (SEM) observations (JEOL, JSM-5600) of the fractured surfaces of the entire test specimen; the value was expressed as the area ratio of the micro-voids to the entire area of the fractured surface. In addition, the average value of the size of the micro-voids and the spacing between micro-voids on the fractured surface were measured via image analysis of the SEM observations. In addition, the quantitative identification of individual micro-components on as-cast condition was carried out using a field emission scanning electron microscope (FE-SEM, Quanta 200F) and an energy-dispersive X-ray spectroscope (AMRTEK, PV72-60030F). Figure 3 shows the macroscopic views of the cross sections of the billets fabricated with ultra-high-density sonication treatment, with descriptions of the positions used for specimen preparation. The macroscopic image of the sonicated specimen demonstrates that a proper sonication treatment provides remarkable grain refinement, compared to the non-sonicated specimen. In addition, it indicates that the outer section of non-sonicated specimen is composed of the columnar grains formed by directional growth from a mould wall, even though the grains that existed in centre section (Figure 2a) and in sonicated specimen (Figure 2b) exhibit apparent equiaxed morphology. Macroscopic views for cross section of billets with positions of specimen preparation for microstructural observation and tensile testing indicated; (a) no sonication and (b) sonication treatment. Figure 4 shows microstructural images for centre positions of the sonicated and non-sonicated specimens; the nominal grain size values are listed in Table 2. As shown, it exhibits a trace of intermetallic compounds such as Al3Mg2 and Mg17Al12 that are locally distributed inside grain and along grain boundary. In addition, it shows that the centre section of non-sonicated specimen includes a noticeable amount of micro-voids, even though it can observe also small-sized clusters of micro-voids in the sonicated specimen. Microscopic views of A5052 aluminium alloy for centre position of billets; (a) no sonication and (b) sonication, respectively. Typical results of SEM observation and EDS analysis on microstructural components are shown in Figure 5. As shown in Figure b–d, the main intermetallic component of A5052 alloy on as-cast condition is composed of Mg-rich phases, i.e. 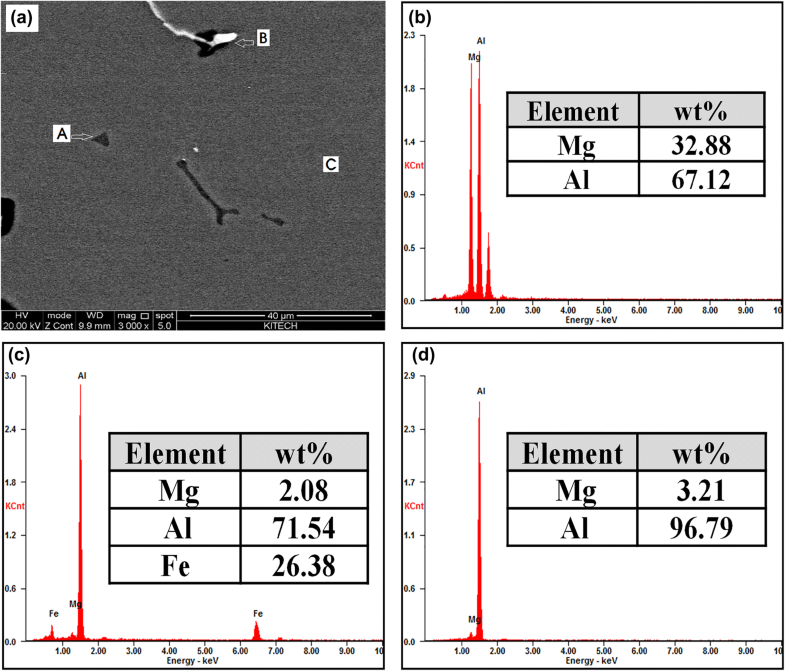 Al3Mg2 and/or Mg17Al12 and Fe-contained phase (Al–Fe series). However, in the present study, even though the rigorous SEM observation had tried to find practical evidence for heterogeneous nucleation by foreign particle of Al–Ti series such as Al3Ti phase, it could not observe a trace of Ti element in Al-rich matrix. SEM images and EDS analysis of an ultra-sonicated specimen; (a) microscopic view and (b–d) EDS analysis for the A, B and C positions in Figure (a), respectively. As listed in Table 2, the nominal grain size of the centre section of the billet is remarkably decreased from 460 μm in the untreated condition to 210 μm for the sonicated alloy, although the grain sizes between the centre and outer sections of the billets in both conditions are practically similar. The nominal values of volumetric and fractographic porosity for the centre section of the billets are remarkably decreased from 1.31 and 62.6% to 0.29 and 31.4%, respectively, by sonication treatment. This variation in porosity induces a remarkable improvement in the nominal values of the tensile properties with the grain refinement induced by sonication treatment. The nominal values of tensile properties with and without sonication treatment are listed in Table 3. As listed, the UTS and elongation of specimens from the centre sections are increased from 105 MPa and 5.6% to 159 MPa and 13.7% with sonication, respectively. And, the nominal value of YS is increased remarkably from 59 to 69 MPa by sonication treatment. With the nominal grain size listed in Table 2, the increases in the UTS and elongation of specimens from the outer sections of the billets are higher than those of specimens from the centre sections, due to the grain refinement induced by sonication. In addition, the SHE and strength coefficient are practically increased as the grain size decreases. However, a deviation of SHE and strength coefficient between centre and outer sections in non-sonicated condition arises from the existence of columnar structure formed noticeably in outer section. The role of microporosity variation on the tensile properties of the A5052 alloy is shown in Figure 6. As shown, the overall level of UTS and YS is obviously improved by sonication treatment, with their individual dependences on microporosity variations expressible as certain relationships with regard to the sonication treatment. In particular, the average YS value is remarkably increased by sonication, and it is reasonable that this arises from grain refinement because the microstructural components such as Al3Mg2 and/or Mg17Al12 phases are almost the same at given material condition, as shown in Figure 4, except for the variation of grain size. However, the fracture elongation of both conditions exhibits a similar dependence on the microporosity variation. From this, the improvement of fracture elongation by sonication treatment is attributed to the microporosity reduction, whereas the UTS and YS are significantly improved through grain refinement by sonication treatment as well as the microporosity reduction. 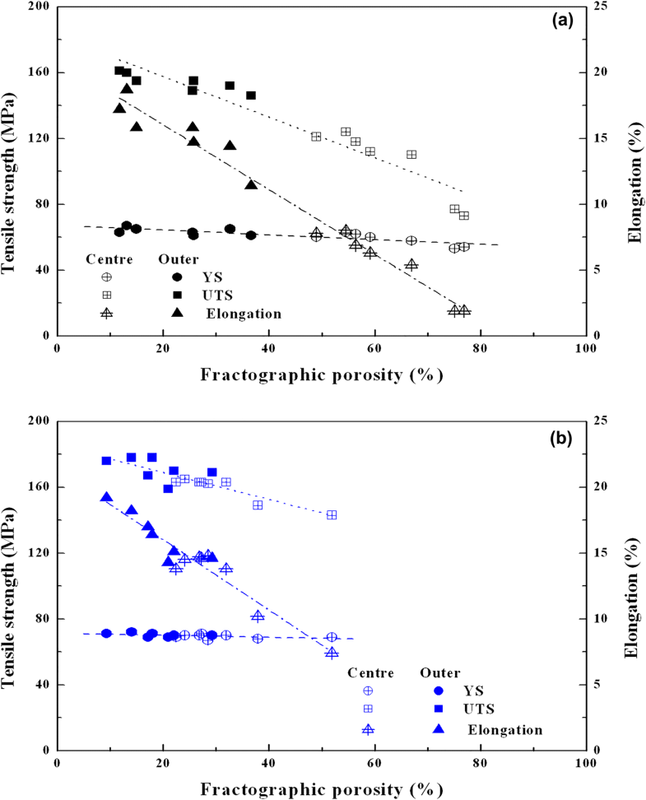 Variability in the tensile properties on microporosity variation; (a) no sonication and (b) sonication. Figure 7 shows the low-magnification SEM views of the fractured surfaces of the as-cast A5052 alloy. As shown, the typical fractured morphology contains deformed areas of Al matrix and random distributions of clusters of micro-voids in the dendritic morphology (Figure 7a). However, practical differences in fracture morphology are not significant between the specimens with and without sonication, except for the average size and distribution spacing of the interdendritic micro-voids formed during solidification (Figure 7b, c). SEM images of the fractured surface in as-cast A5052 alloys; (a) typical morphology of interdendritic shrinkage voids, (b) no sonication and (c) sonication. Figure 8 shows the variability in the tensile properties by sonication treatment on the quality index chart of the A5052 alloy, which was modified from the original form of that for the A356 alloy shown in Figure 1, according to the nominal strength coefficient of the A5052 alloy (K = 370 MPa). 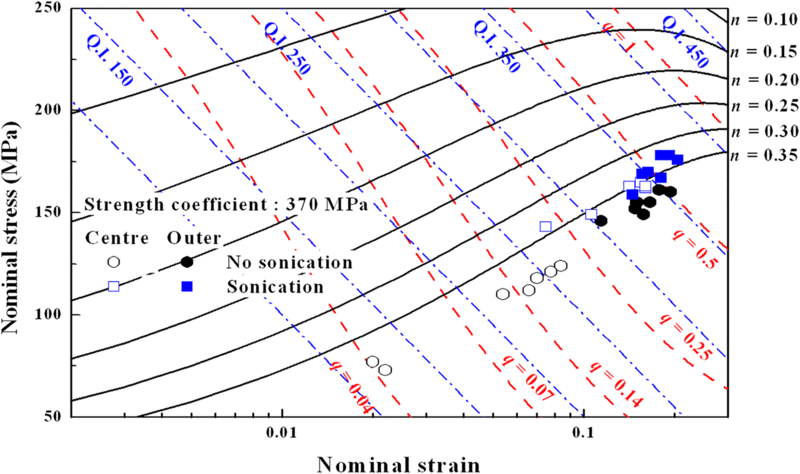 As shown, the nominal value of the quality index is slightly improved through sonication treatment, and the iso-Q lines and flow deformation curves are different from those of the A356 alloy shown in Figure 1. Furthermore, the quality index for the non-sonicated specimen exhibits an extremely wide deviation in the relative ductility parameter, q, i.e. approximately 0.04–0.5. This deviation on quality index arises from a practical dependence of tensile strength and elongation on microporosity variation as shown in Figure 8. Even though the quality index of the sonicated specimen is also distributed with a wide deviation, i.e. q-value of approximately 0.25–0.7, it can be noted that most of the quality index values of the sonicated specimen are located along the flow curve indicated by the SHE, i.e. approximately 0.35. Tensile properties on quality index chart of A5052 alloy based upon strength coefficient of 370 MPa. The chemical composition of the sonication-treated A5052 alloy is listed in Table 4. As listed, the Ti-content is increased from 0.007 wt% in the base condition to 0.080 wt% with sonication. This increase arises from the dissolution of titanium by erosion and cavitation action at the interface between the titanium sonication horn and the aluminium melt.26 However, the EDS analysis performed in the present study could not detect a trace of Ti element in Al-rich matrix. This is due to the fact that the nominal level of titanium content in the A5052 alloy used in the present study is remarkably lower than the optimal titanium content suggested in previous studies.29, 30, 31, 32 Meanwhile, this also means that further improvements in the tensile properties by effective grain refinement with sonication treatment require longer sonication times than that used (5 min) in the present study. The degassing action by sonication is promoted by the acoustic cavitation of melt streaming and the mass diffusion of hydrogen gas into the cavitation bubbles formed at negative pressure below the pressure level of the aluminium melt. This is characterised as a strong point of sonication treatment, in terms of the reduction in buoyancy speed to the melt surface, the increase in travel distance for bubbles in the melt, and the improvement in absorption ability. As listed in Table 2, the volumetric porosity and fractographic porosity are verifiably improved through the sonication treatment, despite the inexact investigation of the degassing action provided by sonication. where P and s are the engineering stress and strain, respectively. And, K is the strength coefficient and n is the SHE. Thus, the modified form of the quality index chart from Eqns. (2) and (3) can be graphically described as shown in Figure 1. As shown, the dashed blue lines represent the iso-Q lines of the original quality index chart determined by Eqn. (1), and the solid red lines (with n-values) and dashed black lines (with q-values) are the flow curves and modified quality index lines determined by Eqns. (2) and (3), respectively. In addition, the iso-Q lines of the quality index and flow curves shown in Figure 1 are practically different from those of Figure 8. Furthermore, the quality index of the non-sonicated specimen in Figure 8 is beyond the range on the flow curve corresponding to the nominal value of the SHE. This arises from the difference of the strength coefficient and SHE between centre and outer sections of a billet in non-sonicated specimen, as listed in Table 3. Figure 9 shows an example of a quality index chart that reflects the measured values of the strength coefficient and SHE of a material condition with no sonication treatment. As shown, the tensile properties of the non-sonicated specimen can be exactly expressed in a different framework of the quality index chart. Modification of quality index charts by reflection of strength coefficient (280 MPa) for centre section of no sonication treatment. where εi and εh are the true strain in the fields near to and far from the void region, respectively, and ∆ is the relative increment of each strain component for the time interval. Af is the area fraction of micro-voids, and b and c are the dimensions of the micro-voids related to the Rice–Tracey equation for lateral void growth, respectively. In addition, n and m are the SHE and strain rate sensitivity, and η and P(α) are the incoherency parameter and plastic constraint factor, respectively. With the given material constants, Eqn. (6) can offer various strain profiles between fields near to and far from the void region, according to the size and distribution aspects of the micro-voids.34,35 From these strain profiles, a specific value of tensile strain can be obtained for given values of SHE and porosity and practically can estimate the nominal values of UTS for each level of strength coefficient using Eqn. (2). Comparison of experimental results with quality index obtained from constitutive prediction. On the other hand, for nominal values of porosity and distribution aspect of micro-voids at given porosity level, Figures 11 and 12 show the modified quality index charts with regard to the nominal level of porosity for a given a/l value (Figure 11) and the variation of the average size and distribution aspect of micro-void (a/l) for a given porosity level (Figure 12). 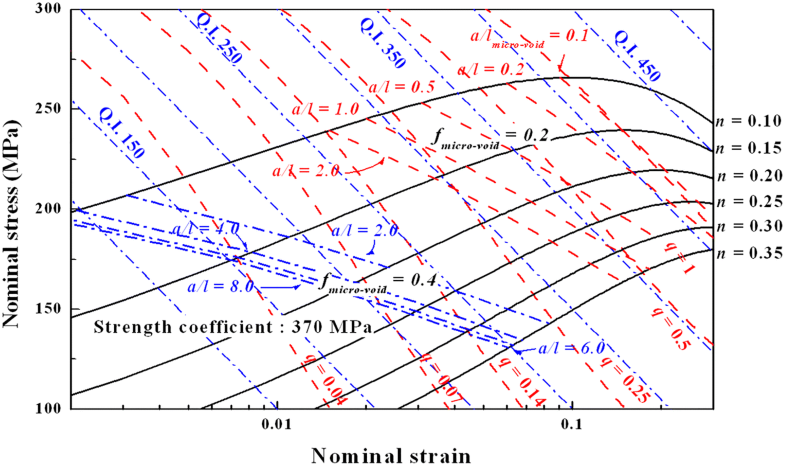 As shown, the contribution of the overall level (fmicro − void) (Figure 11) and distribution aspect (a/lmicro − void) (Figure 12) of micro-voids to the fracture strain becomes increasingly dominant as the SHE decreases. 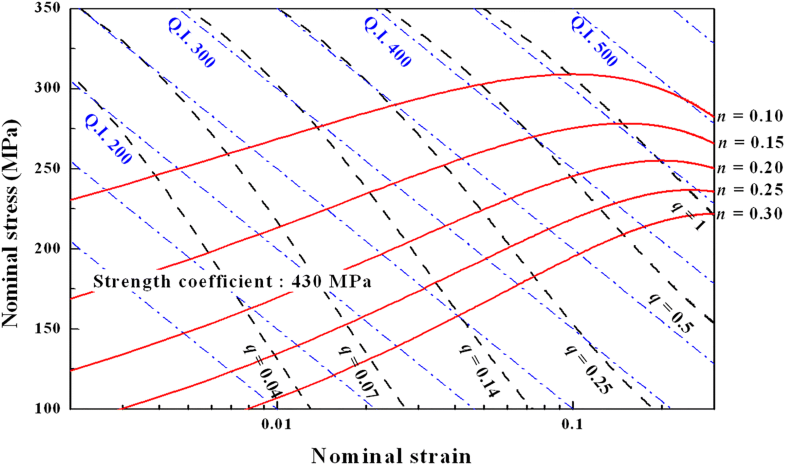 This is consistent with the theoretical solution predicted by the constitutive model for tensile instability.34,36 However, Figure 11 shows that the iso-Q line and fracture strain predicted by the modified constitutive model for a defect-free condition are higher in value than the nominal value of the relative ductility parameter, q = 1. This is because of the assumption of the distribution aspect (a/lmicro − void) for a given porosity level, as will be discussed in a subsequent study in detail. Modified quality index charts considering the variation of porosity level (fmicro − void) for a/lmicro − void = 1.0. Modified quality index charts considering the distribution aspect of micro-voids (a/lmicro − void) for fmicro − void = 0.2 and 0.4. The nominal values of UTS and elongation of the A5052 alloy with ultra-high-density sonication treatment can be increased by approximately 40 MPa and 5% compared to those of the non-sonicated alloy. The nominal value of YS also increases from approximately 60 to 70 MPa through the effective grain refinement provided by the sonication treatment. 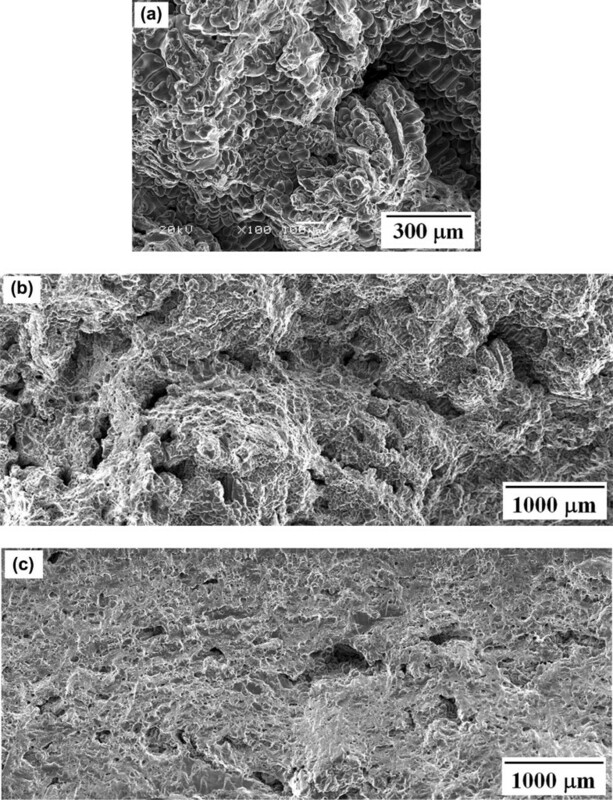 The improvement of tensile properties of the as-cast A5052 alloy by sonication treatment clearly arises from porosity reduction achieved through degassing action induced by the ultrasonic excitation, as well as grain refinement through heterogeneous nucleation by the formation of small-sized foreign particles and the fragmentation of dendrites formed in the chilled region around the titanium horn. The quality index chart for the tensile properties of a material can be precisely modified through the reflection of the strength coefficient and SHE based on the constitutive model. In addition, the quality index of tensile properties depends practically upon the microporosity variation because the UTS and elongation are fundamentally related to the variation of fractographic porosity, and its overall dependence was confirmed by experimental results and constitutive prediction. The dependence of the tensile properties on the microporosity variations can be expressed in terms of a quality index chart that considers the porosity level and distribution aspect of micro-voids, as well as the SHE. And, the tensile properties of a material for a defect-free condition can also be effectively described in a quality index chart through the modified constitutive model for tensile stability. This research was supported by the Development Program for Industrial Core Technology through the Korea Evaluation Institute of Industrial Technology (KEIT) and funded by the Ministry of Trade, Industry and Energy (10048817) and was also supported by the General Researcher Program through the National Research Foundation of Korea (NRF) and funded by the Ministry of Education, Science and Technology (NRF-2017R1D1A1 B03028953).